Perhaps the cover of Phiona Mutesi gives a compelling picture of how chess serves as a universal agent for social change. Jamaal Abdul-Alim recounts Mutesi’s story from Tim Crother’s stirring book titled, “The Queen of Katwe”. 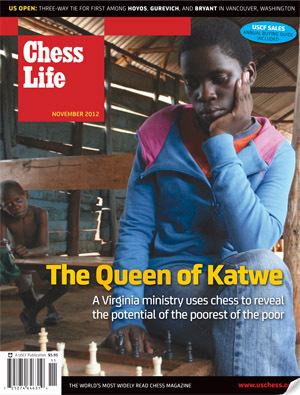 It describes the hardships of a slum in Uganda and her chess journey. The book has been reviewed on these pages, but the lesson to learn is that we do not choose chess as a hobby or activity… it chooses us. In Mutesi’s case, it was her route out of an existence of poverty… not physical poverty… but poverty of a creative ideas. Once chess took hold, it opened her to so many experiences that she could never have imagined coming from such abject poverty. While a Virginia organization (Sports Outreach Institute) helped to provide the funding for chess, Mutesi’s living conditions were a constant battle each day as she even escaped death twice. Thus, the focus should be on her triumph alone. Howard Goldowsky provides a review of the book and does not share the unbridled and glowing optimism of others. He rightfully discusses the embellishment of Mutesi’s skills in the book and scoffs at the lack of chess insight, but of course this is not the central point of the story. It is not a chess story (or the discussion of chessisms and chess techniques) as much as it is a story of triumph. The activity could have been soccer, math, basketball or table tennis and the story would be the same. Abdul-Alim actually interviewed Mutesi’s teammate Ivan Mutasasira via Skype about the chess program and how they were forced to improvise with meager resources. The interview was less about Mutesi than it was about how the chess program was able to provide the conditions for success. However, the book dealt less with the chess program and more with Mutesi’s challenges. To even make the club meetings was often a challenge only overcome by her determination. Wow!! Very impressive. Thanks for the article Daaim. Thanks for this piece which I just discovered today while working on some promotional events here in the US for Phiona. Yes the focus of Jamaal’s story was on the chess program as we wanted to share that the Phiona story is not a fluke. Other children are also seeing their lives change. Despite the most desperate conditions, the skills learned while playing chess transcend the physical and give these kids a perspective that they can achieve and grow. I do hope many of our US players will share the story and be encouraged to help Sports Outreach change lives. 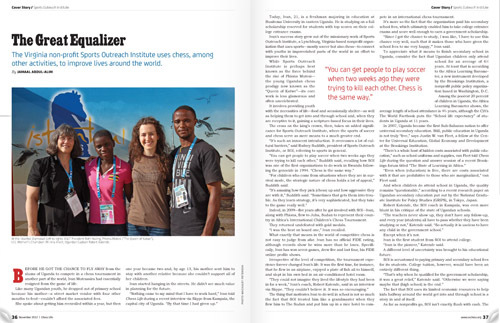 I also hope they will share the book “The Queen of Katwe” with their non-chess playing friends and family. It is not about teaching chess, it’s about inspiring people with the possibilities that can come from chess. That’s a message the book reviewer for the most part missed but that’s the message the chess world needs to share more if we want to see chess truly expand in America. Yes, we want to find the next Bobby Fischer but for most of us it’s more about telling folks chess will helping Bobby Smith and the other children next door. I was moved by the book’s human element. Certainly I also like following the intricacies of the Sicilian Najdorf with the best of them. However, this book showed how chess can literally transform not only a person, not just a village, but a country. Uganda can use this as a way to show that amongst their poorest citizens can they find nuggets of hope and opportunity. It is quite a humbling story.